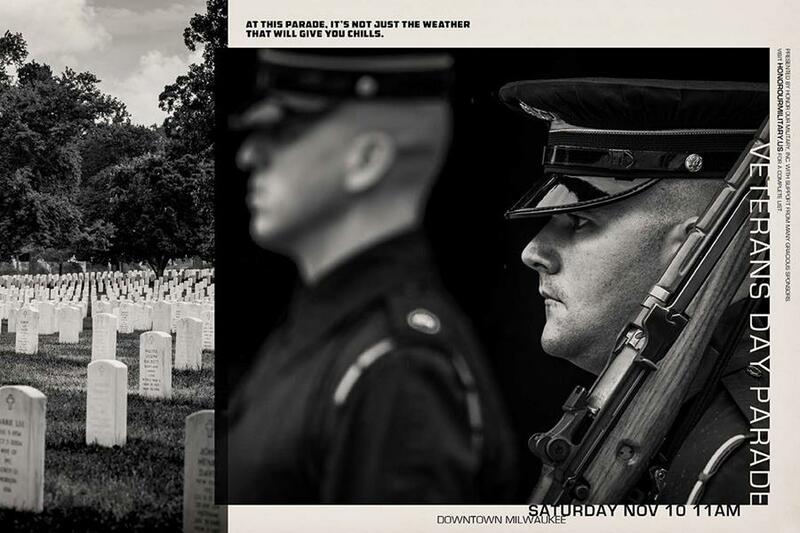 Join us at the War Memorial Center for a Veterans Day ceremony sponsored by Milwaukee Police Post 415 and Milwaukee Firefighter Post 426 of the American Legion. The annual Veterans Day Banquet is organized by the Veterans Board of Directors. The guest speaker is Dr. Daniel S. Zomcheck, Director of the Zablocki VA Medical Center in Milwaukee. Who will be named this year’s Milwaukee County Veteran of the Year? Find out at this dinner! 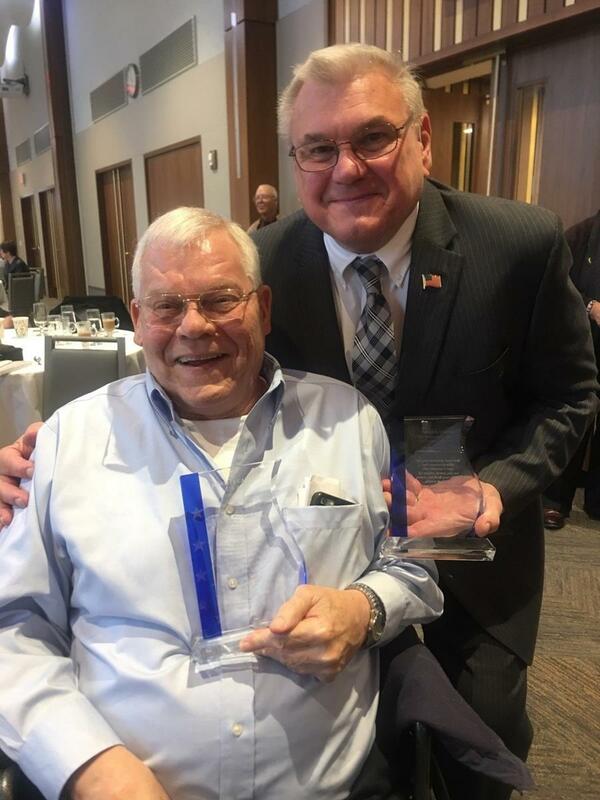 Congratulations to our executive director David Drent and Vietnam veteran Joe Campbell for being recognized by the Veterans Board of Directors for their service to veterans during this year’s Americanism Awards breakfast. The annual event is always held at the War Memorial Center the last Sunday in October and numerous organizations who deal with veterans and active duty military give out awards. Congratulations to all of this year's awards winners honored for everything from helping homeless vets to families of deployed servicemen and women. So much outstanding service happening in our community! Make plans to attend next year. 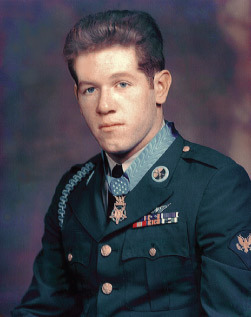 The Medal of Honor On November 19, 1968, President Lyndon Johnson awarded Army Specialist Gary G. Wetzel, of South Milwaukee, our nation’s highest and most prestigious decoration, the Medal of Honor. In 1861, the Medal of Honor was established by Congress (that is why it is frequently, but incorrectly, referred to as “The Congressional Medal of Honor.”) It is awarded for extraordinary heroism above and beyond the call of duty. Many brave men and women have been awarded various medals for heroism in our many wars, but this medal is given only to the bravest of the brave. 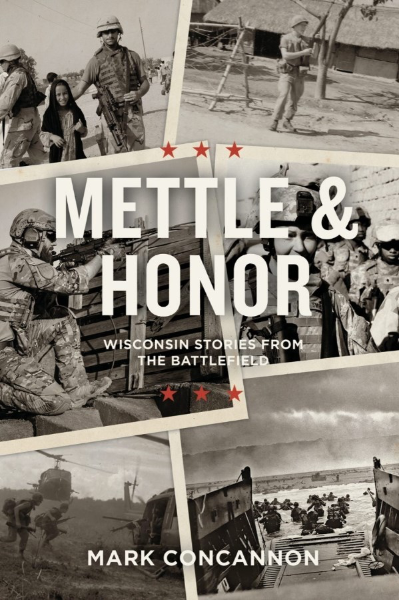 In addition to Gary Wetzel, 62 other Wisconsinites have also received the Medal of Honor. On November 13, 2018, the War Memorial Center Board of Trustees with commemorate the 50th Anniversary of Gary Wetzel receiving the MOH at a ceremony in Memorial Hall. Our Board applauds the heroism of Mr. Wetzel and we deeply appreciate the many appearances and speeches he has made on our behalf over the past decades. He is especially effective reaching the younger audiences who marvel at his dignity, sense of humor, and of course, his history. He was a hero then and he continues to build on his legacy through his continued patriotism and leadership to this very day. Gary G. Wetzel. A hero, a patriot, a role model, and a friend. Congratulations, Gary! Veterans Day Ceremony On Veterans Day, November 11, at 10:30 am, Milwaukee Police Post 415 and Milwaukee Fire Post 426 of the American Legion will present its Annual Veterans Day Program at the War Memorial Center. Our guest presenter this year is Wisconsin VA Secretary Daniel Zimmerman. 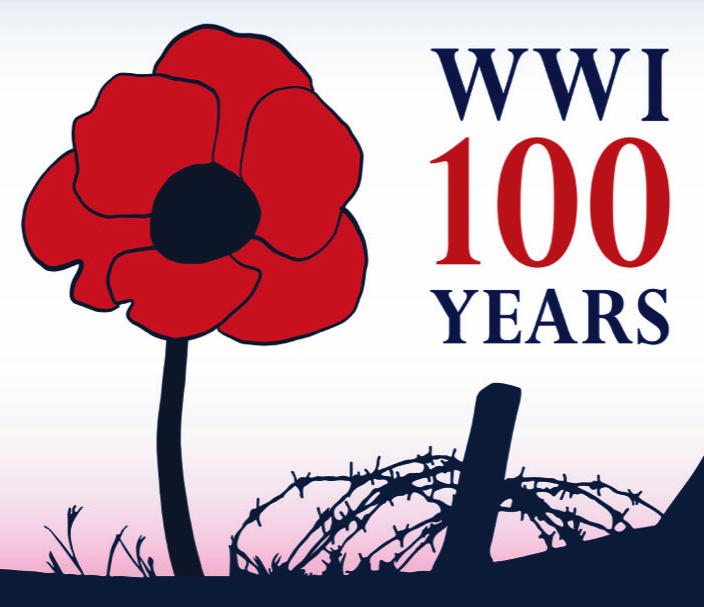 Of all the venues that he could have chosen for the 100th anniversary, we are honored that Secretary Zimmerman has selected the War Memorial to make this year’s speech. We hope you can join us for this special event! Happy Birthday! Finally, I want to wish a happy birthday to The United States Marine Corps established 242 years ago on November 10. Semper Fi!! Veterans. They don’t have the best of everything – they just make the best of everything. 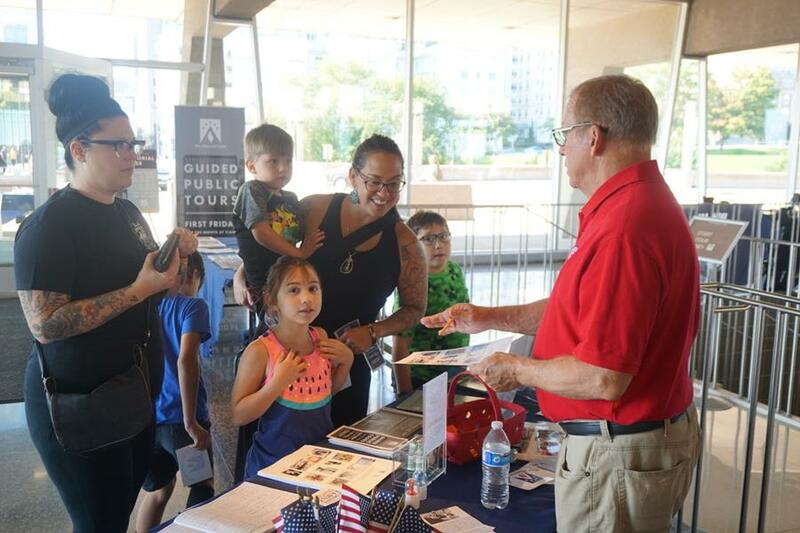 The War Memorial Center believes every veteran has a story. A story that’s critical for future generations to hear. That’s the mission of the Veterans Story Project. This month we feature Air Force veteran Jean Pyzyk. Jean was a high school teacher when the Air Force Reserves called her to serve in Iraqi Freedom. She went from seeing young people in class to young people on the battlefield and the fear in their eyes was obvious. Over the past three years, the WMC education program has been collaborating with the Shorewood Lake Bluff 5th-grade teachers to develop programming that gives students unique in-person access to veterans. In October, we accompanied the 5th-grade classes on a field trip to the Wisconsin Department of Veterans Affairs Veterans Home at Union Grove, where students interviewed veterans living there. Students sang patriotic songs and then in small groups asked veterans questions about their lives and their service. The programs are under the direction of Lake Bluff teachers Jessica Aubuchon and Jessica Hau, who also help coordinate the school's annual two-hour Veterans Day Program. On November 1 we wrapped up the four-part lecture series commemorating the end of WWI with the talk "Doughboy MIA," by author and historian Robert Laplander. 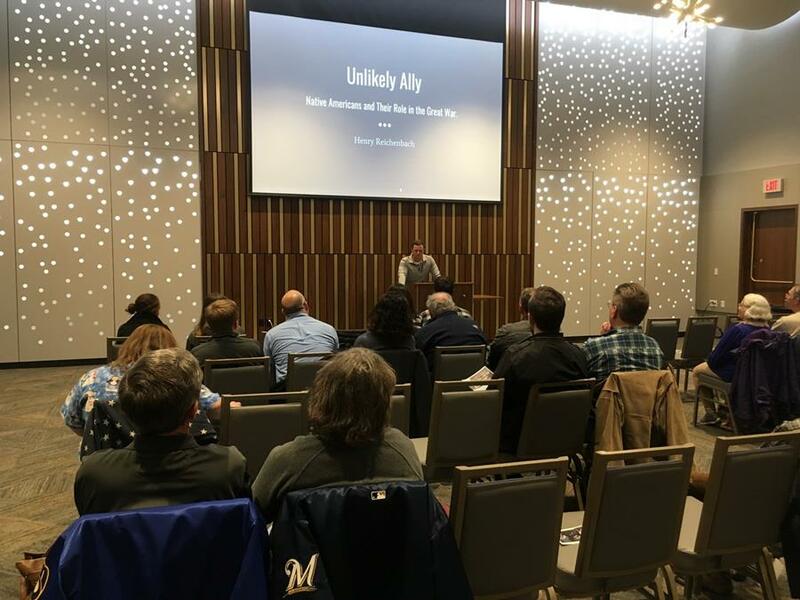 More than 100 people attended the lectures, presented by Honor Our Military and hosted by the War Memorial Center as a promotion for Milwaukee's annual Veterans Day Parade, which has the theme of WWI this year, in honor of the centennial of Armistice Day.  Volunteer at the War Memorial Center! The weeks leading up to Veterans Day are the busiest of the year - as they should be! We are looking for volunteers to help with two large school groups coming on Nov. 8 and Nov. 9, 9 a.m. to noon. Volunteers will help get students where they need to be, lead activities and enjoy the free programs, which will include a WWII Iwo Jima veteran, Milwaukee War Dogs, the amazing group Dogs2DogTags, and the short film about a local soldier who enlisted in the Navy at age 15 - plus help students make a 9-foot-wide flag mosaic project! This is an easy, feel-good time. For more information, contact Kristen at education@warmemorialcenter.org or call 4143-273-5533.